I got my first true “euro” board game recently. 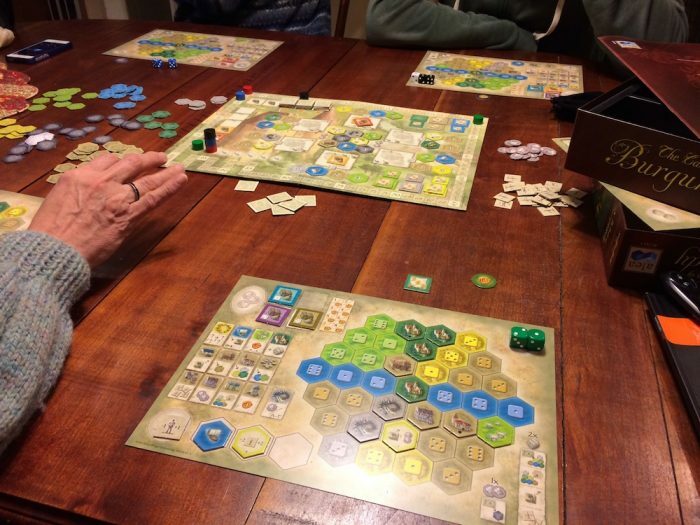 Castles of Burgundy. It’s not a worker placement game. In Castles of Burgundy players take turns choosing from a central board and building their kingdoms. There is so much strategy involved. You need to choose what to build, when to build it and where to build it. But you also need to carefully watch your opponents. You may need to change your plan to prevent them from achieving their goals. We’ve played the game twice now. Both times I’ve only concentrated on building some parts of my kingdom, while everyone else seems to go for everything. I prefer to finish the castles, science and village sections first, then I’ll go for the farms and boats. Everyone else builds whatever is most convenient at the time. I’m not sure if I have a good strategy yet, or if I’m just getting lucky.